When you buy at the stand for roasting, pick out fairly uniform sizes, so they finish cooking about the same time. The roasting time can vary, so always check to make sure squash doesn’t “collapse.” The sprinkling of cinnamon or nutmeg on top is delicious, but you can experiment with garam masala spice, cardamom (and honey), or other favorites. Preheat the oven to 350°. Line a baking sheet with parchment paper, if you have it. With a knife, split the squash in half lengthwise. Scrap out the seeds with a spoon. Brush with olive oil and place, cut-side down, on the baking sheet. Bake for about 25 to 30 minutes, or more depending on the size. Poke with a fork or use your finger to touch the squash. It should feel soft but not collapsed. When cooked, remove the baking sheet from the oven. 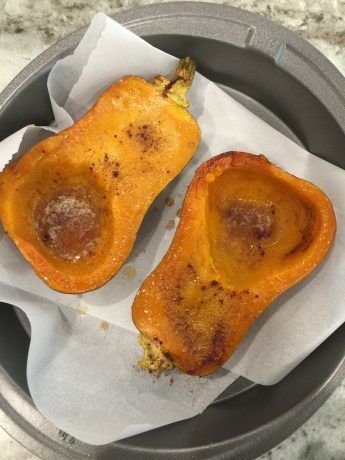 Turn the squash over and put a dab of butter in each. Sprinkle to taste with salt and fresh pepper. Add a pinch of cinnamon, and a taste of either maple syrup, local honey, or brown sugar. You can serve right away, or reheat in a hot oven when ready to serve.